Freenet, the top free lifestyle app in Google Play engaging online Filipinos nationwide through rewards, celebrates its 3rd Anniversary by giving freenetizens an exclusive access to the most requested artists of today with FREENIVERSAYA: A FREEnet Concert. 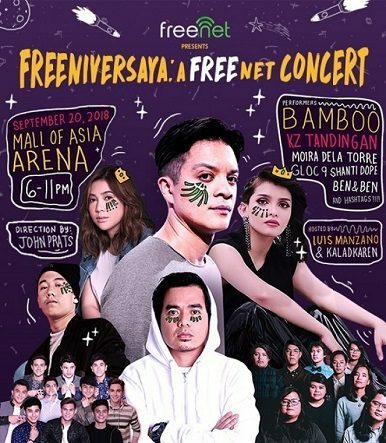 Freenetizens joining the event on September 20, 2018 will be jamming and grooving to the beats and tunes of some of the hottest OPM acts of today, including Bamboo, KZ Tandingan, Moira Dela Torre, Shanti Dope, Gloc 9, Ben & Ben, and Hashtags at the SM Mall of Asia Arena in Pasay City. Watching the FREENIVERSAYA concert is FREE! To score a concert ticket, all you have to do is download the freenet app from Google Play or the Apple App Store, register, and complete missions inside the app to earn freenet points. The more freenet points you earn, the better seats you get at the concert as you will use these points to redeem tickets in the in-app freenet shop. Earning 100 points will get you a seat at the General Admission area, 200 points will get you better seats at the Upper Box, 500 points for even better seats at the Lower Box and 900 points at the VIP 2 area. 1,000 points will get you closer to the artists at the VIP 1 area and if you earn 10,000 points you will be able to get the best seat and view with your VVIP ticket and even get a chance to hang out backstage during the concert! Once you’ve redeemed your ticket, you will receive an SMS confirmation from freenet containing your reference number. All that’s left to do is to go to an SM Ticket outlet near you, present your SMS confirmation and claim the print-out version of your ticket. You will need to present this along with your freenet app before you enter SM MOA Arena on the day of the concert. Earn those points now and see you at the FREENIVERSAYA concert! For more info, visit this link: http://frnt.ph/gettix. P.S. You can access DR on the Go for FREE on the Freenet app. You will not be charged or deducted from your load when you access my blog from the app.